Is there any sense in telling you about the importance of a personal blog? We are sure you understand that it’s necessary, so let’s focus on more down-to-earth questions. What are the things to look for in a personal blog WordPress theme? A personal blog is a kind of business card, so you’ll want to choose a stylish one. Simplicity and minimalism are always en vogue, so we recommend that you consider this style. The next essential point is responsiveness. As the mobile gadgets market continues to grow and more people prefer to surf the Internet on-the-go from their smartphones and tablets, your blog should be accessible from mobile devices and look attractive on their screens. Pay attention to sliders and galleries, as you will demonstrate your best projects there. They should be responsive, along with your text. It’s good if there is a possibility of adding a store to your personal blog. This way you will be able to make money from it. And don’t forget about the search engine optimization and website load speed. Your website should load quickly and be SEO optimized to have high Google rankings. Google should love your site and place it at the top of search results. Otherwise, users just won’t find it and go somewhere else. Why buying one of these personal blog WordPress themes could be beneficial for you? Actually, you can start building your personal blog from scratch or go to WordPress.org and find a free theme instead of a premium one. The choice is always up to you, but think twice before you make that choice. Building a website from scratch is time and money consuming. But what’s even worse, the result may disappoint you. When you download a free theme, remember that it comes to you without support and you are dependent on yourself for any issues that may arise. And you are likely to have them, as the quality of free themes is lower than the quality of premium templates. Apart from that their functional features are limited, so when you start to install the plugins it lacks, just one of them could ruin your website, which would be somewhat distressing. Don’t you think that it’s much better to pay a few bucks for a beautiful, feature-rich theme from one of the leading providers? Support, plugins, updates, and lots of other goodies are delivered inside the template’s package. This will save you from many headaches, and you’ll receive your brand-new sleek and user-friendly site in just a few days. There is no quicker and more cost-efficient way of launching a personal blog than building it on the basis of one of the top-quality themes featured in the list below. Well, now you are welcome to make your pick! 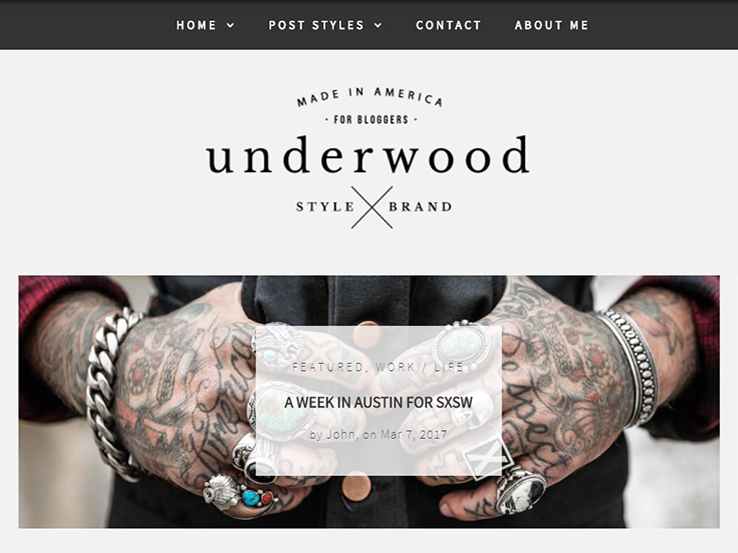 Underwood opens our list of personal blog WordPress themes. Its layout combines hipster and ultra-modern elements, which create a sharp and bold environment perfect for a masculine blog. 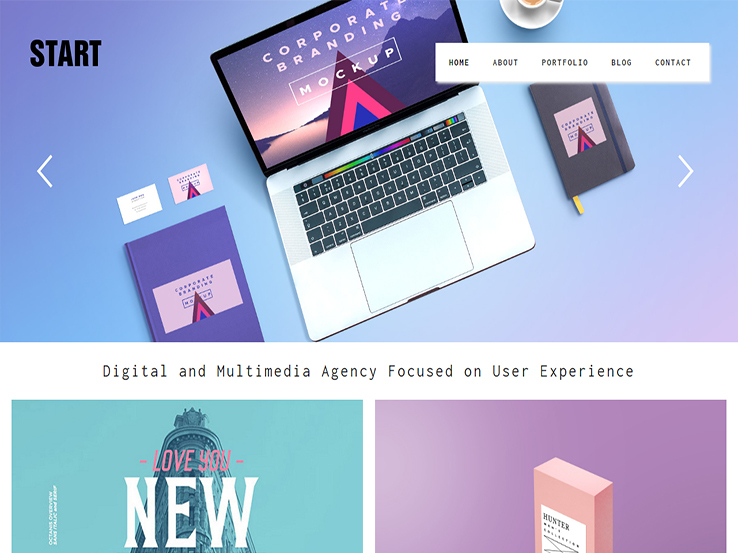 The general style of the theme will draw users’ attention as it will look different from the soft, low-contrast WordPress websites with which the Internet is flooded. Underwood was crafted specifically for smart bloggers who are ready to tell their incredible stories to the world. The theme with clean code offers a variety of functional features for the purpose. For instance, you can enrich your content by embedding videos in your articles’ headers or within the columns of text. Audio clip format, image, and image galleries are available as well. In addition, Underwood theme supports both social sharing and social following features without additional plugins or services required. 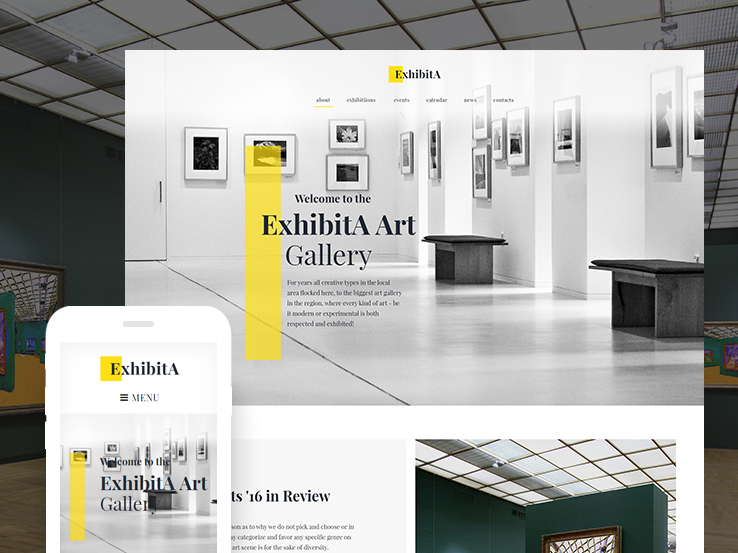 This personal blog WordPress theme will become an impressive presentation for your art gallery or museum. You can post the most eye-catching exhibits into a slider to make site users stop and stare. A semi-transparent header with logo and main menu on it doesn’t prevent you from viewing the entire picture. Information about the gallery can be arranged in three columns supplied with simple outlined icons. Streaming video presentation in the background will become a spectacular addition to your storytelling. 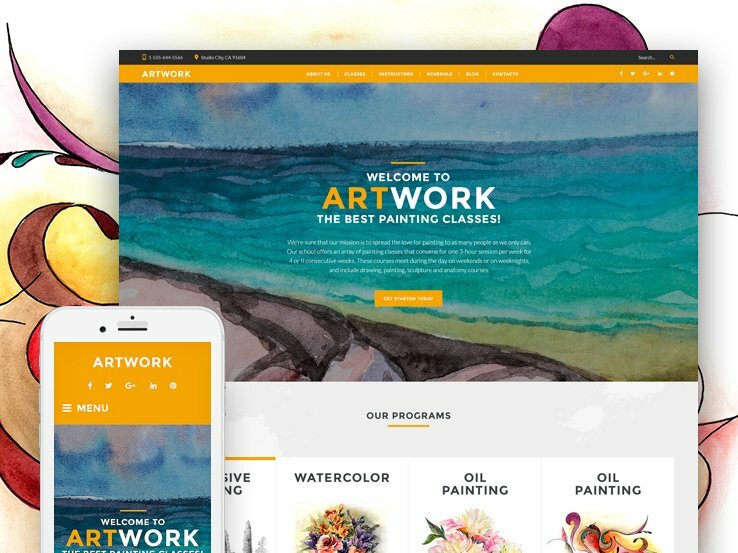 A works gallery is also available on the home page, so the users will be enchanted from their first seconds on your site and won’t abandon it until they view everything it has to offer. Google Maps plugin will show museum-goers the way to your place of business. This WordPress theme was developed for art schools, museums, and art galleries. It has an attractive color scheme. Orange elements draw users’ attention to the relevant information and add life to the design. According to color psychology, they also stimulate the users into action. School programs are featured on nice banners that respond to each user’s action. They boost the website’s navigation significantly as the visitors can use not only main menu links but also those banners to skip through website pages. Ghost call-to-action buttons seamlessly blend with the rest of the layout. Instructors’ section includes teachers’ photos, their bios, and links to social media profiles. You can include an Instagram feed at the bottom of your web page. This will help you promote your art school more efficiently on social media. The theme was designed for art galleries, museums, and personal exhibitions. Its diamond-shaped logo clearly stands out against the white background. Main navigation menu is hidden. It drops down on hovering the top of the page. As you scroll down, you see the best artworks of the current exhibition. They grab users’ attention and don’t let them leave for other websites. The images are accompanied by brief texts and ‘View’ buttons. Full-screen pictures and videos offer the users an unforgettable virtual tour of your art gallery. They are given the opportunity to view even the minor details of the featured works. You can present the posts in different formats easily switching to the gallery, image, link, or video post types to choose the needed focus on particular works. In a word, the theme is a perfect choice for your art gallery. 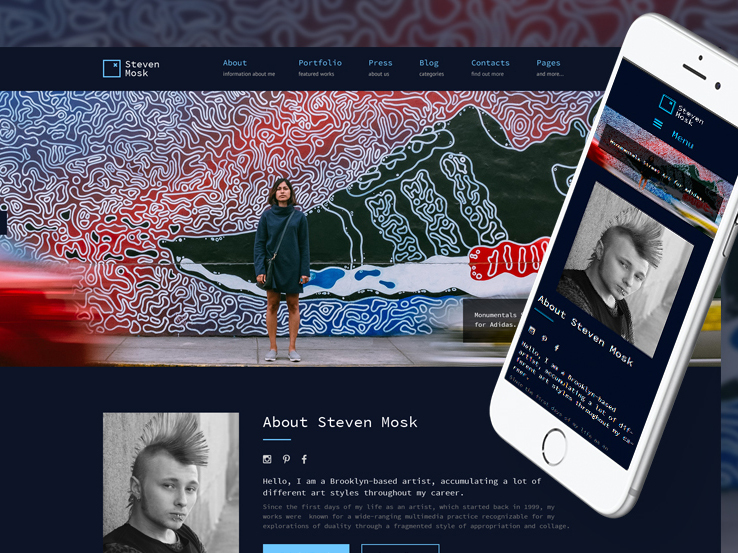 This navy-blue theme may become a great personal blog for young and daring artists. Its full-screen slider showcases contemporary artworks. The slider is a top-notch attention grabber, so you can be sure that your works will be noticed. The main menu of the theme is sticky. It has a fixed position on the page, so the users will have all necessary navigation links at hand all the time. Please note the typography solution of the theme. A kind of digital font conveys the contemporary feel of the website. A simple form at the bottom of the web page lets the users get in touch with the artist quickly and easily. The theme is also equipped with TM Gallery. The functionality allows you to create beautiful, responsive galleries, and display them in a wide variety of layouts. That’s exactly what you need. 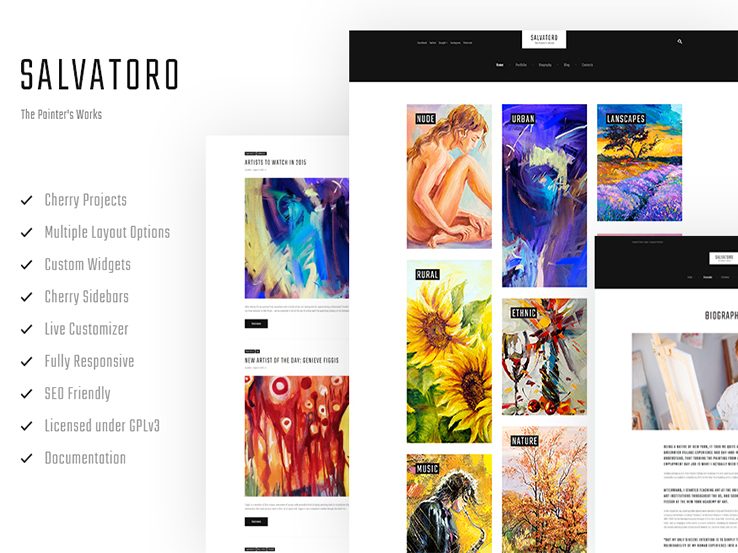 This art gallery theme is developed in a contemporary clean, minimalist style. Site visitors can see gallery environments on the full-screen header image. This is a good trick to immerse them deeper into your website layout and engage them with its content. Bright yellow-color elements emphasize the most significant details. The theme has thought out navigation. It sticks to the top of the page as you start to scroll down and stays there all the time while you are on site. What else is of major importance for an art gallery website? The answer is in the question, it’s a stunning gallery, of course. 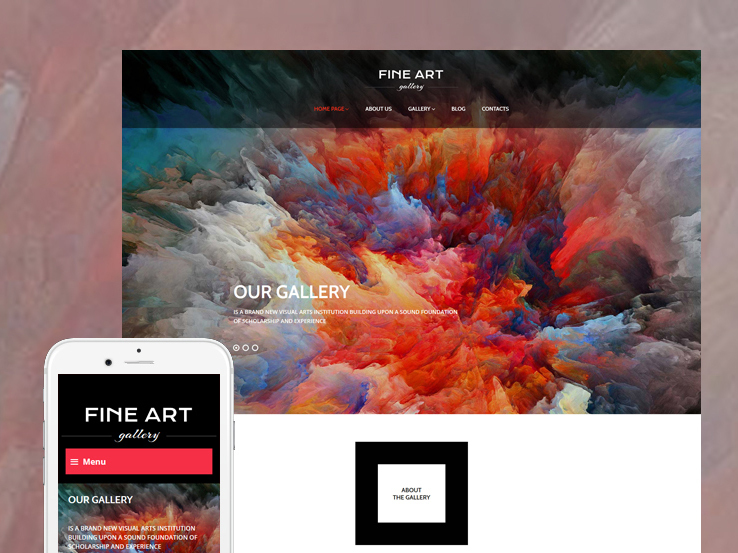 This theme gives you a wonderful opportunity to create beautiful, responsive galleries, and display them in a wide variety of layouts. Hover effect will make your virtual exhibition, even more, attention grabbing. If you know what you wish to say to the world and you want to do it with style, take a closer look at the sleek, modern design of this theme. Note that each element of its design is carefully crafted and corresponds with the latest web design trends. The theme is provided with a setup wizard that will help you install your theme, plugins and sample data in a few clicks. 7 header layouts coming with the theme will give you a relaxing freedom of choice. You don’t need to worry about the customization process of your site. It will be simple. Customize your site with multiple theme options and view all the changes you make to your design live without reloading your page. Do you like bright colors and geometric shapes when they are used in design? Creado could become a good option for your personal blog WordPress theme. Show everybody what you are up to. 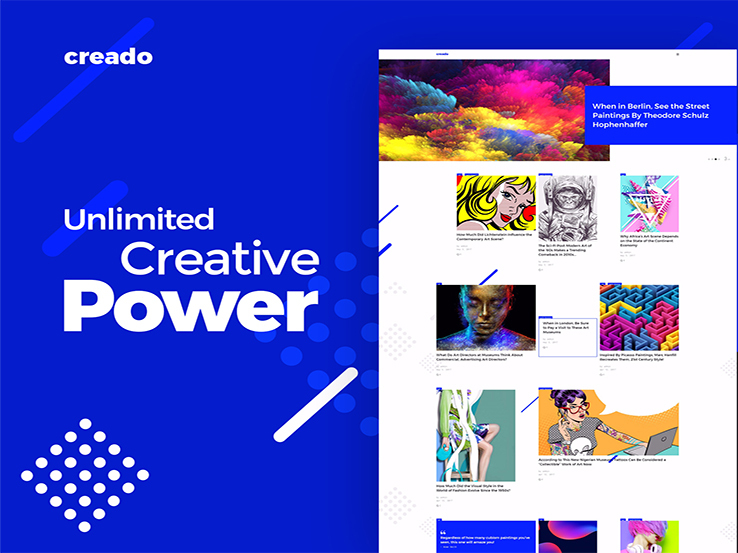 Be innovative with Creado, one of the first themes powered by the Grid CSS technology. Forget about the old layout restrictions and arrange your content freely, in a kind of creative mess. Use the power of custom widgets that will enrich your theme with advanced functionality. Build a stronger online presence with Simple Slider, post carousel, and social media widgets that offer you additional ways to display your content. Your artistic personal blog WordPress website built on the basis of Creado will be SEO friendly as the theme’s code and structure are additionally optimized to comply with Google’s guidelines. 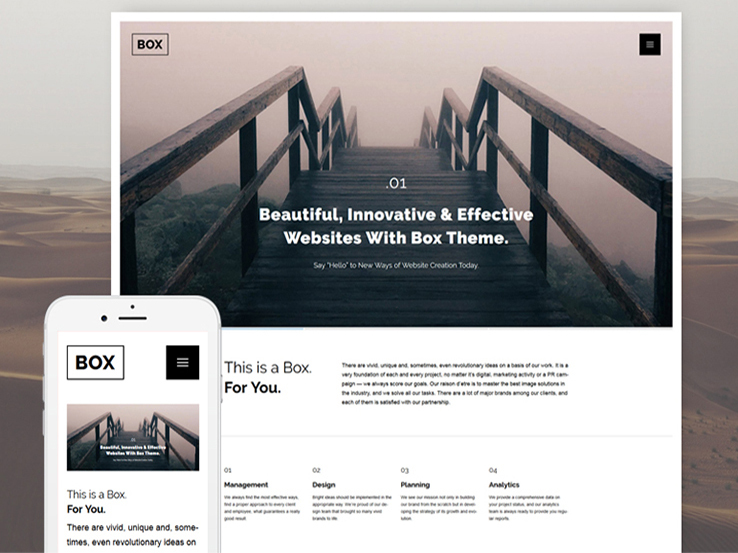 Riba PRO is a beautiful personal blog WP theme. By purchasing it you get the chance to become the greatest storyteller ever. The theme combines attractive design and professional development. It offers you so many possibilities… Are you going to run a multilingual website? No problem, Riba PRO works perfectly with WPML. Don’t like the default colors? Use the unlimited color possibilities for your website elements and change your website layout according to your company style. Be sure that your website will look incredible on retina displays because the theme’s code is developed to provide ultimate performance on all retina displays, providing sharp details and quality to your website elements. As for the cross browser performance of the theme, it will be excellent as theme developers constantly test and improve its code to produce the best results. 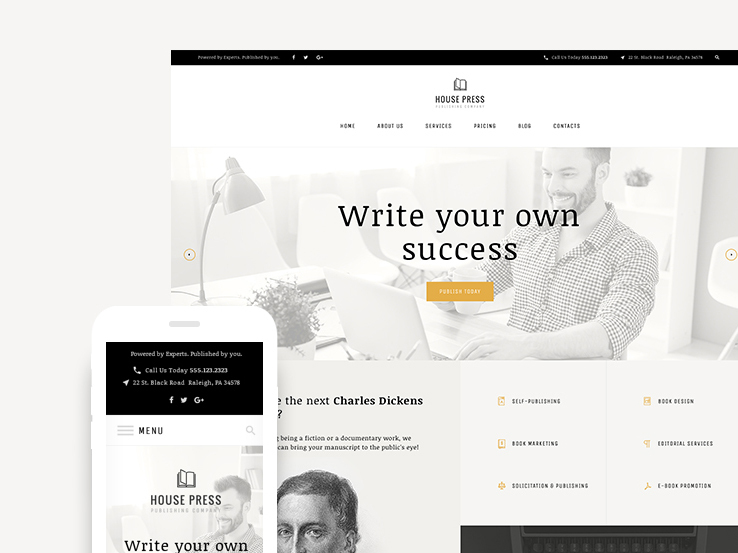 The Essence is a cheerful personal blog WordPress theme for all types of creative individuals. The theme is flexible and simple enough for anyone to use. 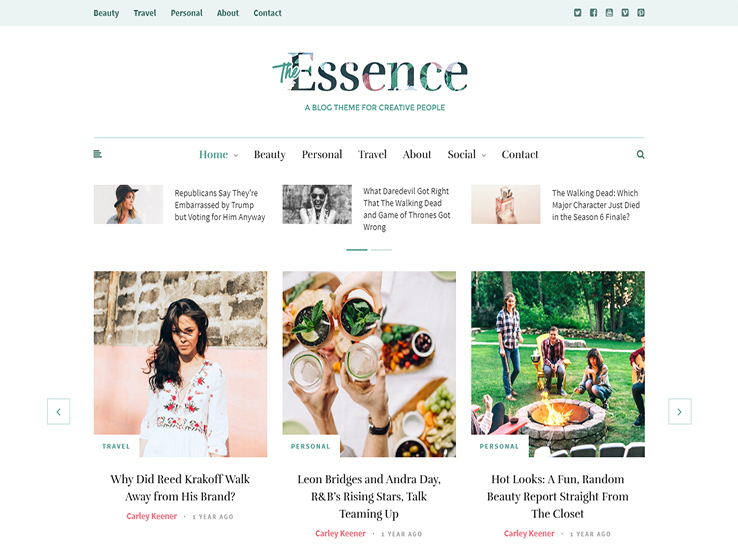 The Essence is the perfect magazine or blogging theme for your next project. It looks beautiful on all devices. The theme automatically adapts to whatever device your reader is using. You can choose from 17 different blog layouts to find the style that is perfect for your site. Play around with column and sidebar combinations until you find the one that is absolutely perfect for you. You can handle the theme even if you have no coding skills. The Essence harnesses the full power of the WordPress Customizer for easy real-time changes. Tack on the Meridian Styler plugin that is included in the theme’s package and you will be able to create a unique website without knowing a single line of code. This personal blog WordPress theme for a professional photographer was developed in pastel colors. They create a positive, welcoming mood on the web page. The light color solution is easy on the users’ eyes, so they are encouraged to stay on the site longer. 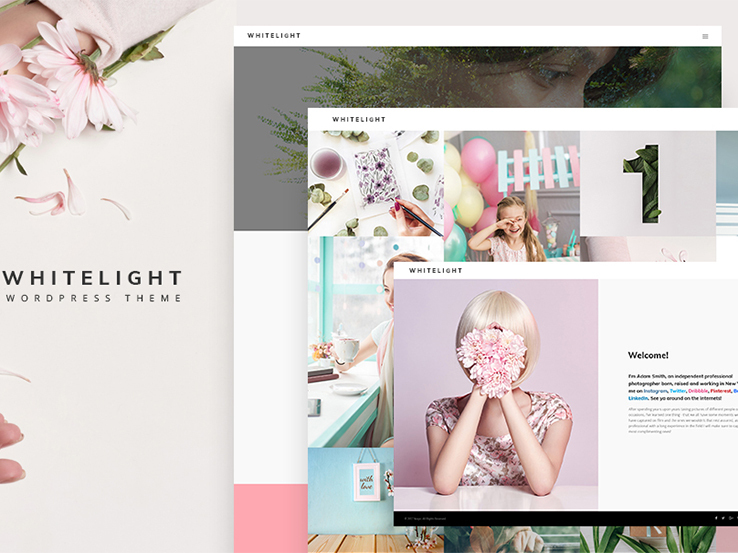 You will find hardly any other personal blog theme that is as content-oriented as WhiteLight. In fact, the entire home page of the theme consists of the kicky photos provided with hover effect. This makes the web page not only cute but usable. The visitor can navigate through the website by clicking the images. The main menu is really accessible as it is hidden and slides out from the right side of your screen when you click on the hamburger icon. Would you like to know about other fantastic features of this theme? Click the ‘Details’ button above. 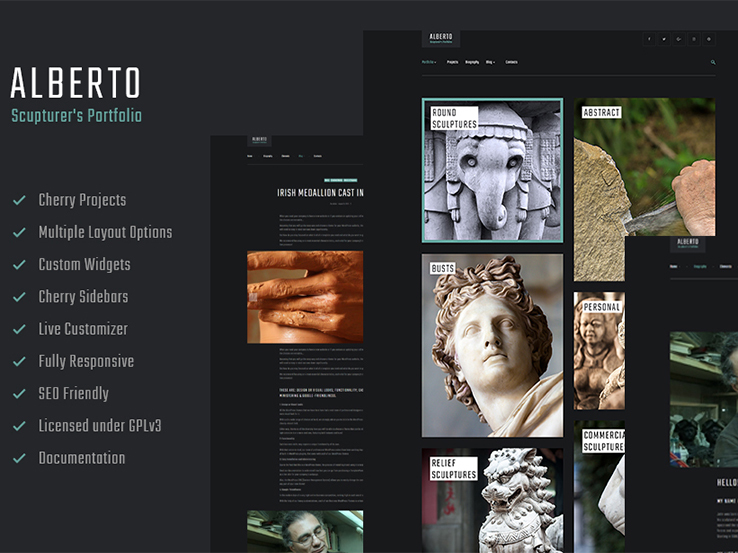 Alberto is a personal blog WordPress theme suitable for a sculptor’s portfolio. It has a dark background, which makes the artist’s works stand out prominently. Sculptures and photos zoom in and are framed on hovering. This adds dynamics to the web page layout. The search form is placed at the top of the page, so it is easy to notice it and find exactly what you are looking for quickly. Outlined social media icons give you additional opportunities to promote your website. Just link them to your social media profiles, and your fans will be able to know more about you there. Create a gallery of your projects in a matter of minutes with Cherry Projects plugin, which enables you to choose from a large number of animation and layout options, add custom meta data, and filter the output by tags and categories. Monstroid2 is a good investment as the theme is so universal that it is suitable for almost any kind of website from a personal blog to a web design agency. It is packed full of essential and custom functionality. The theme’s multiple layouts and design skins are really diverse. Monstroid 2 will let you choose from 9 design options: its set of design skins range from neutral and corporate to creative and colorful. When it comes to headers and footers, simply choose the perfect layout you like, then add a phone number, address, working hours and other relevant buttons and calls-to-action to make it work. Are you going to run a corporate blog? This can be a great customer loyalty tool. There are 4 different layout styles added to make your blog content remarkable. Click the ‘Details’ button and get to know about the rest of Monstroid2’s advanced features. Do you like the simplicity and honesty of a black and white color scheme? 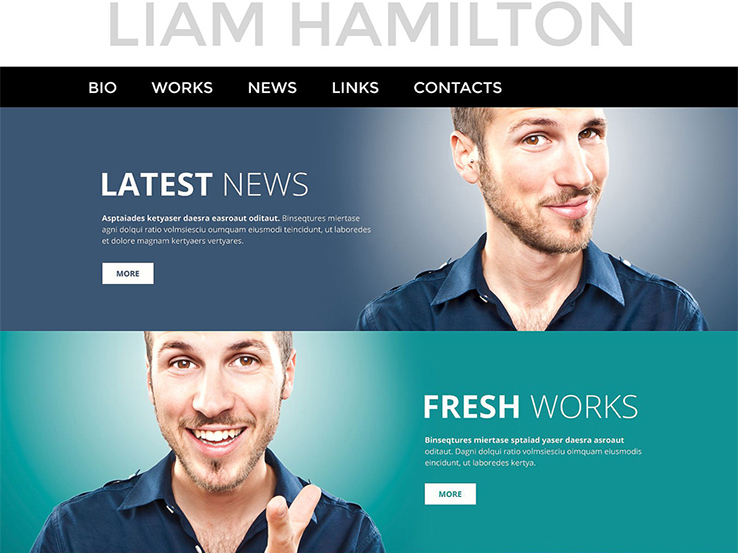 Then, choose the Houston personal blog WordPress theme. Its design is responsive, so your website will quickly adapt to any gadget with any screen size the user has in hand right now. Text and images are flexible as well, so they will be rendered correctly. This will boost your traffic as your visitors will not be restricted by any limits regarding their location or device. 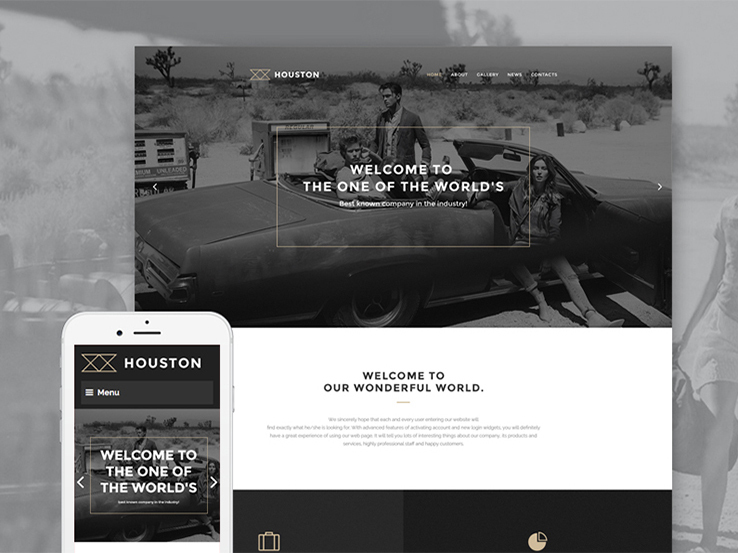 Houston is a retina ready theme that will perform and look excellent even on displays with high pixel density. This feature will help you keep the site up to date for years to come. The above features became musts for current websites, if Houston is loaded with them, together with many others, it’s worthy of your attention. 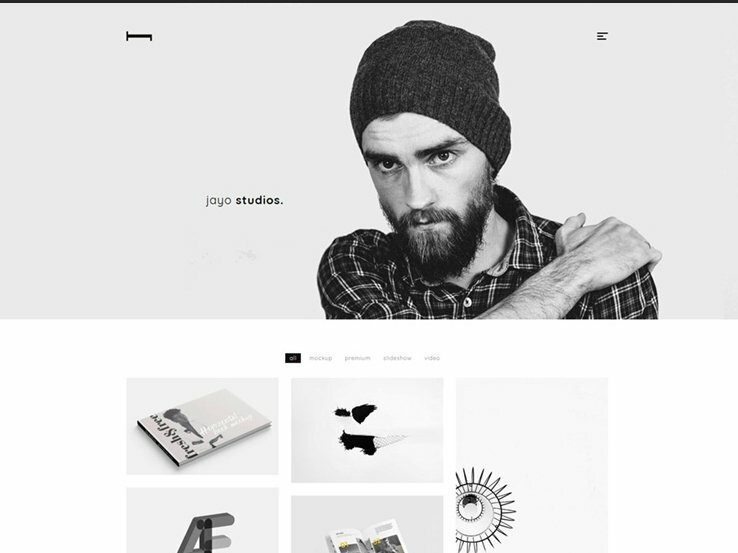 Jayo is a super minimal lightweight personal blog WordPress theme for agencies and freelancers. Jayo is built with the popular framework Bootstrap 3.x, HTML5, CSS3, and jQuery. This theme is fully responsive and works on all devices. It features page header with background image slider that livens up the web page. The theme’s demo is imported in one click. You can choose between Grid, Masonry, 2,3, and 4 portfolio layouts. Your blog layout can also vary according to your wishes. Are you going to embed videos for your portfolio items and posts? The functionality is supported by the theme, so you will be able to tell site visitors more about yourself. The ‘About Us’ page template is equipped with team grid, services and logo carousel, while the ‘About Me’ page template includes sliding skill bars and both education and work experience sections. As you see, your extraordinary personality and creative efforts will be completely covered. 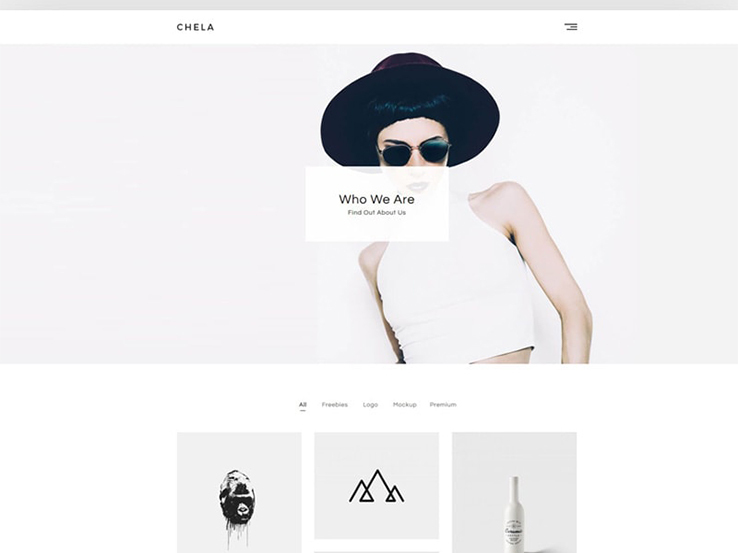 Chela is another lightweight, minimal and modern personal blog WordPress theme ideal for agencies and freelancers. Your website will look classy on all devices as Chela is fully responsive. It has powerful and popular framework Bootstrap 3.x, HTML5, CSS3, and jQuery in its core. The theme even lets you save $25 as its package includes Advanced Custom Fields PRO. You can place your best works into Front Page Slider to bring them into focus. BTW, the theme’s demo can be imported in a click, which will save you from extra movements. You probably want to know how your portfolio will look as this is the most important part of your future website. You can arrange your visual content in a Grid, Masonry, 2 or 3 columns style. We advise you to view the theme’s demo. It will tell you much more than this brief description. Are you a painter? Then, this trendy, Instagram-style personal blog WordPress theme is exactly what you are looking for. The theme’s header is neat and modest and does not distract visitor’s attention from the paintings showcased below it. Hover over them and see how the images respond to every movement of your mouse. You can use the interactive pictures to navigate seamlessly through the website. These are the kinds of simple things that prompt the user to take their next step and which have a big impact on the overall usability of your blog or website. They don’t make the visitor think, which is right as people come to your website not to check the level of their intelligence, but to enjoy the beauty of your artistic works. You can go and make sure yourself how intuitive and eye-feasting this website is. 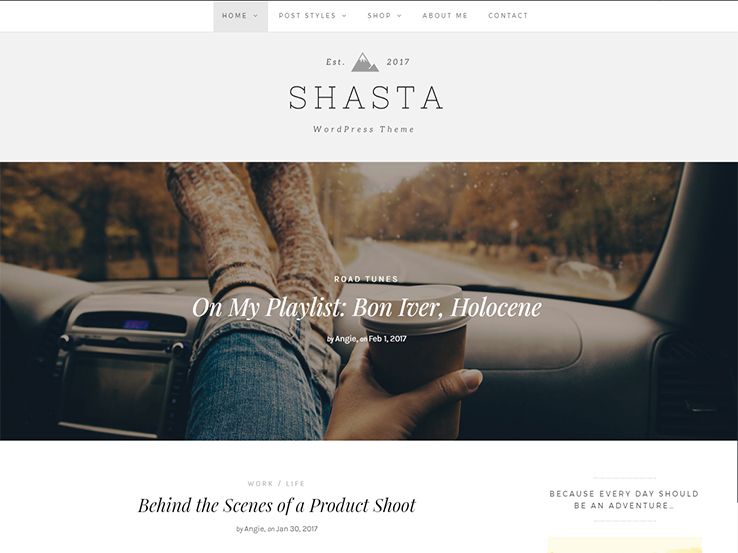 Shasta is a crisp, modern and flexible lifestyle personal blog WordPress theme that is shipped with 4 front page layouts, 9 post styles including video and audio layouts, and tons of customization options packed into its easy-to-use dashboard. This elegant blog-style theme lets you highlight your best content with a large full-width post banner on the front page, then a cascading, grid-style article layout below. However, you can choose a traditional blog layout or one of the stylish grid layouts, with or without sidebar if you like. Enough white space lets readers focus on your gorgeous images and typography. By the way, Shasta links up with your social media, too. A tiled Instagram feed can be placed above the footer and in the sidebar. The theme comes with custom widgets and widgetized areas for additional customization. 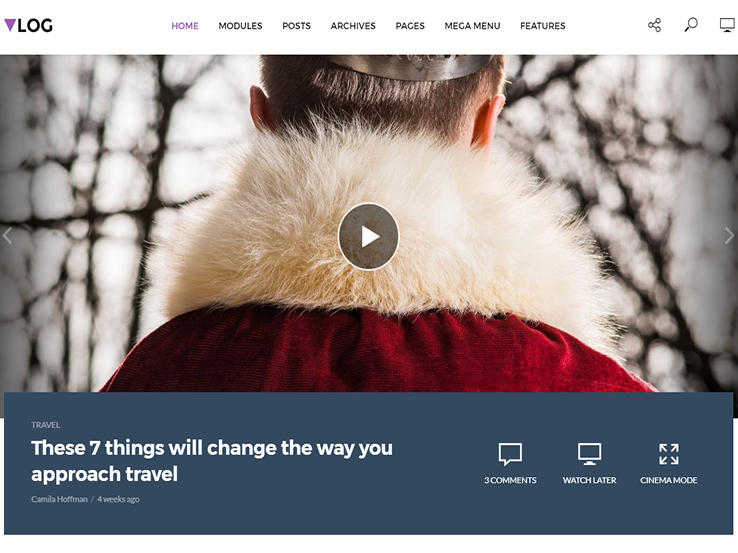 Wonderer is a personal blog WordPress theme that is suitable for a review magazine. What business do you run? Are you a professional blogger or maybe a publishing/news company? Anyway, you want to cater to your readers’ needs offering articles on a nice website. 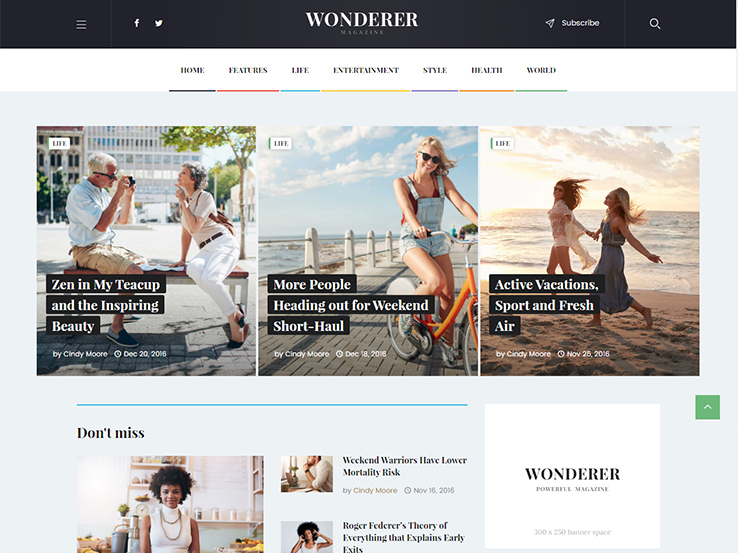 Consider Wonderer, a brand new WordPress theme that has lightweight structure and a design with excellent readability developed specifically for online magazines. Wonderer allows publishing news in different styles. Several page layouts are included for you from which to choose. However you can create your own by using Visual Composer and widgets. In addition, the theme is compatible with Uber Menu plugin. Please note that it is not included in the purchase bundle. Are you ready to give Wonderer a try? 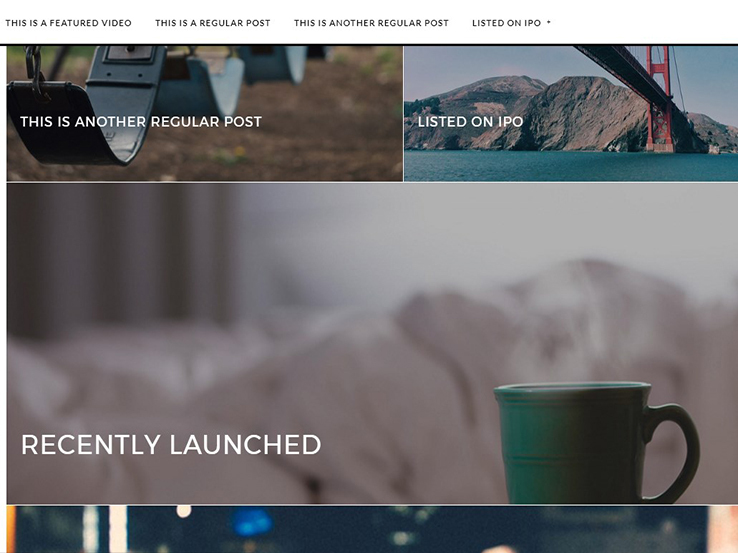 Vlog is a personal blog WordPress theme with a strong focus on videography. 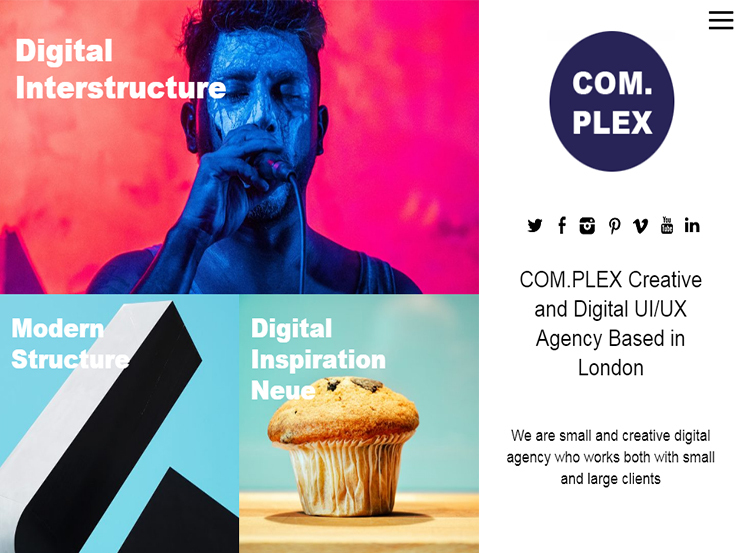 It also perfectly complements the needs of complex magazine websites with sophisticated layouts and dynamic ways to present your videos and articles any way you can imagine. Vlog is the number one choice if you need a website for video-blogging, video tutorials or any sort of viral video sharing. The theme is fully compatible with YouTube, Vimeo, Dailymotion and other common video content. Thanks to the amazing Series plugin, you can group your videos and articles into playlists. Isn’t that exactly what you need for tutorials and other multi-part content? Vlog lets your visitors save videos and easily access them later, as well as watch the videos in a distraction free cinema mode. Don’t look for a better option for your website. This one is absolutely perfect. 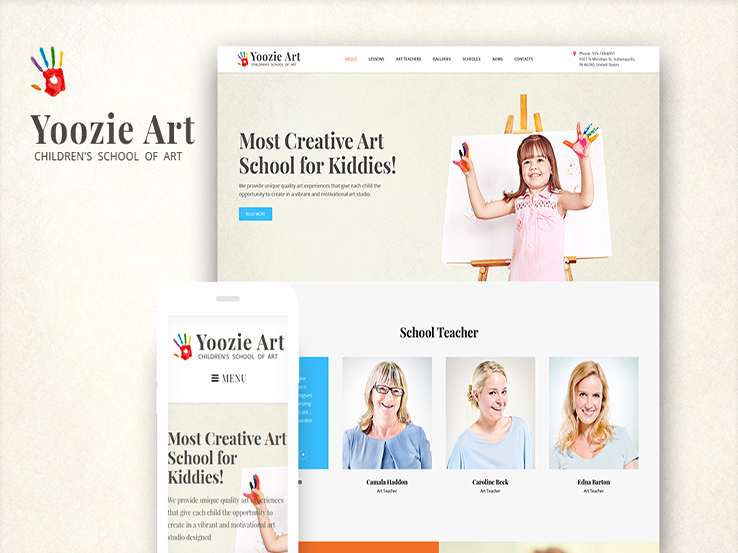 This playful personal blog WordPress theme was created for kids’ art schools. If you need to present your classes in a way that would be attractive both to parents and their kids, this theme is a great option. Even if you don’t know much about coding, you will be able to cope with your website customization. Build pages easily without touching a single line of code with flexible Power Builder. Take advantage of more than 25+ modules, a library of presets, and drag-and-drop functionality. You can easily customize the design of your theme with an advanced set of configuration options. Power gives you full control over your site. It goes without saying that Yoozie comes with free, lifetime 24/7 support and easy-to-follow documentation guides that walk you through each step of setting up the theme and using it for your project. 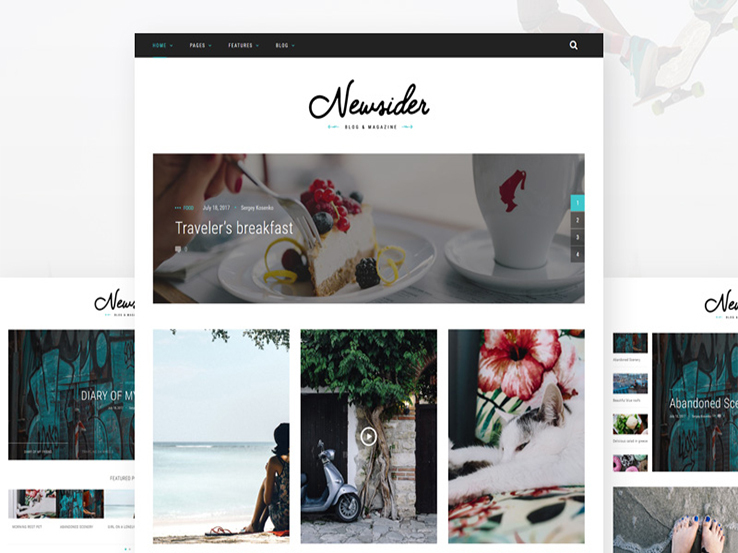 Newsider is a clean personal blog WordPress theme that fits for a magazine site as well. It has a fixed position menu that sticks to the top of the page when you start to scroll down and stays there all the time while you are on site. This way you don’t need to scroll all the way up if you want to skip to another page. The theme has a memorable logo and offers different types of content presentation. For instance, you can feature your info in a slider, embed videos, etc. The left sidebar is very serviceable. You can find additional links accompanied by thumbnails, newsletter subscription form, social media icons, Instagram feed, and even a slider for ‘Author’s Choice’ posts there. The theme is very informative and optimized for its purpose. This personal blog WordPress theme created in trendy material style is best for web design and development agencies. If you are running one or the other, you understand that your prospective customers will judge how skillful you are by looking at your website. This means that your website should be really special. 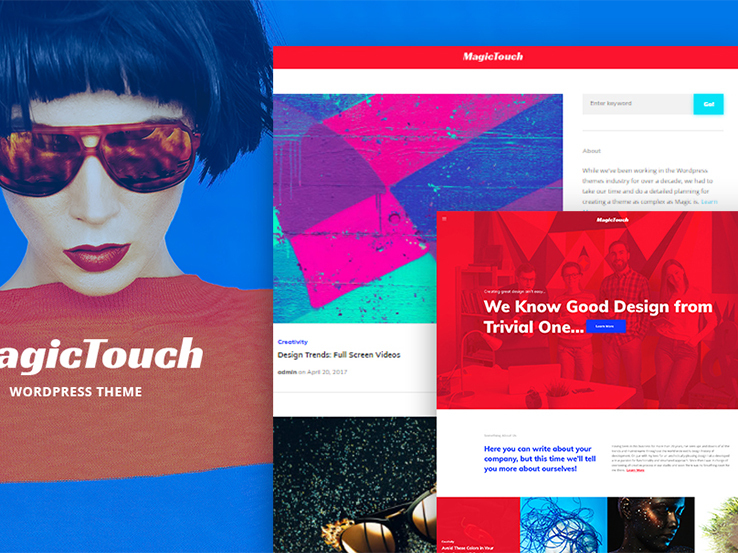 MagicTouch will help you build such a website. The theme is delivered to you with the ultimate pack of the Best Plugins all meant to enhance your website’s functionality. Do you like the images used in this theme? Then, you will be pleased with the fact that all of them are included with the template’s package. You’ll also get 15 topical images relevant to the theme. They are shipped as a nice little bonus. Are you ready to know more about MagicTouch? Press the buttons above! 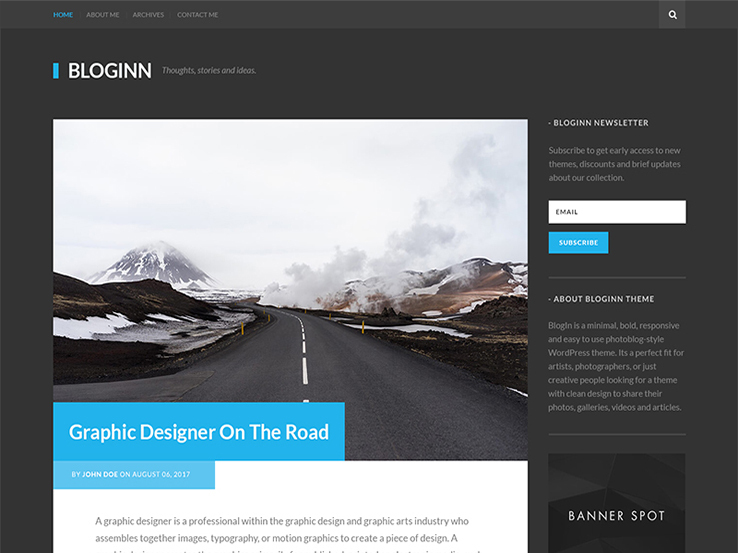 BlogInn is a classical personal blog WordPress theme designed in neutral colors. It is minimal, bold, responsive, and easy to use. The theme is recommended for designers, photographers, or just creative people looking for a theme with a clean design to share their thoughts, stories, and ideas. Buying this theme you can sleep well feeling safe and secure. You will get theme updates with new features and bug fixes on a regular basis. BlogInn developers make sure that it is compatible with the latest version of WordPress. The theme provides swift and friendly support. If you need help setting up your site, you can ask for one-on-one email support. Support managers know BlogInn and their job inside out, so you may ask them anything. 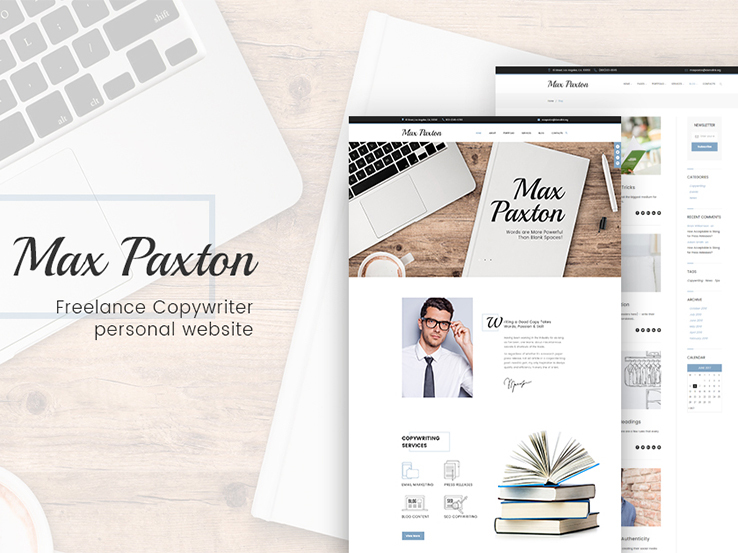 MaxPaxton is a personal blog WordPress theme designed for copywriters and journalists. It looks clean, serious, and professional. Simplified to its core, its setup wizard will help you to install your theme, plugins and sample data in just a few clicks. The theme’s content modules allow you to add multiple content types to your page. This includes buttons, images, pricing tables, contact forms, sliders, and much more. Each of them has an extended set of options that you can tweak to match the style of your website. Just add an online store to it for free in 5 minutes. The theme lets you do that, as it is Ecwid ready. Chika is an elegant personal blog WordPress theme crafted for creative people such as fashion bloggers, photographers, or travelers. Unique elements of the theme’s design will emphasize your taste and idea of a beautiful design. Chika is compatible with WordPress 4.6. It is shipped with Wide and Boxed layout versions. The theme is built with HTML5, CSS3, and the latest Bootstrap 3 framework. As you might have already understood, the theme is 100% responsive, plus it is ready for retina displays. With 600+ Google Fonts included, you can freely experiment with your website’s typography. With popup subscribe form it will be easier for you to fill in your emails list. Chika is Child Theme ready, has Advanced Theme Options Panel, Unlimited Color Options, and lots of other features you will love. Do you like metro style? Most people go crazy about its bright colors and sleek layouts. 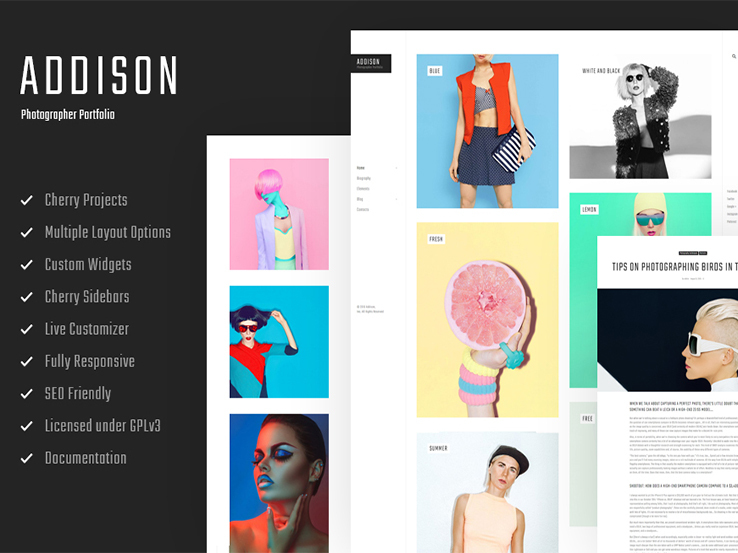 Would you like your design portfolio to look fashionable? OK, choose this theme then. It will delight you not only with colored tiles and jaw-dropping animation effects, but plenty of other terrific features. For instance, the theme offers you 7 header layouts, so you’ll have a wide choice. Also, you will be able to take advantage of custom widgets. They will enrich your theme with advanced functionality like Simple Slider, post carousel, and social media widgets. They will help you build a stronger online presence and offer you additional ways for displaying your content. The theme is licensed under GPLv3, which means that you pay for it only once and own it for ever. Professionals will appreciate this benefit. 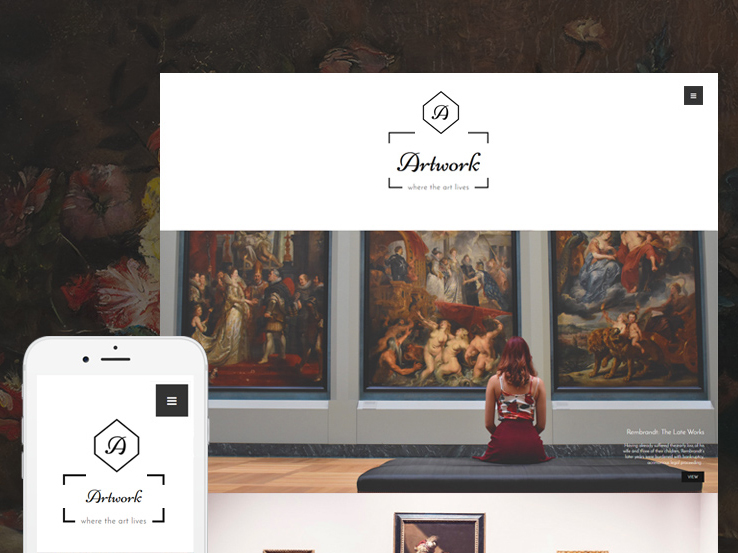 Need a personal blog WordPress theme for your museum or art gallery? 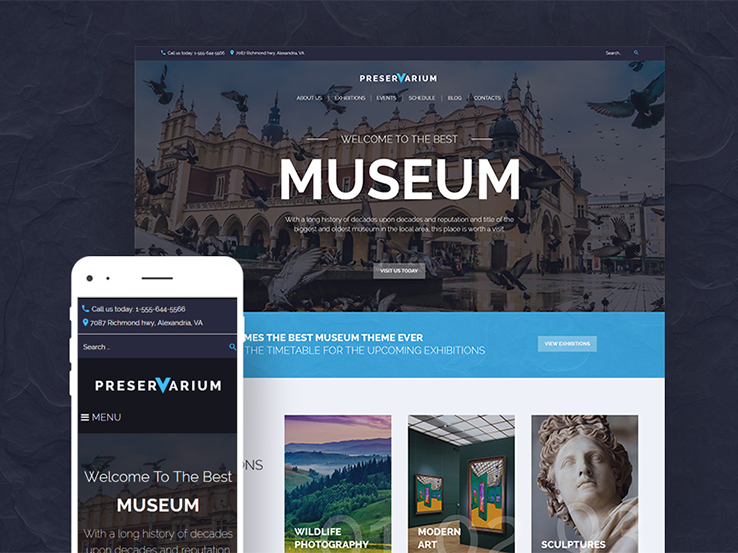 We advise you to have a closer look at this theme, which appears magnificent, yet modern, just like a museum website should be. Its full-screen image with logo, main menu, welcome message, and call-to-action button sparks visitors’ interest and encourages them to undertake further site exploration. What else can you find on the home page? Quite a lot of useful stuff: a gallery of exhibits, updates on pending events, featured articles from the blog, customers’ testimonials, Instagram feed, Google Maps, etc. Almost all images on the web page are supplied with hover effect which breathes life into the website. The theme is equipped with Appointment Manager plugin, which will save you time by letting your customers book an appointment directly on your site. Need a perfect CV? This personal blog WordPress theme may become an outstanding one for a photographer, coder, or designer. Full-screen background video captures your attention. The main menu is placed right below it and sticks to the top of the page when you start to scroll down. ‘About’ section contains designer’s photo and a functional button for downloading the resume. The skills block is designed in infographic style. All skills are visually presented in percentage circles. Regular blocks about work experience and education are placed below them. The portfolio is categorized and supplied with hover effect. Customers’ testimonials serve as a trust signal for the employer, who can get in touch with the designer with the help of a simple contact form or additional, detailed contact information. 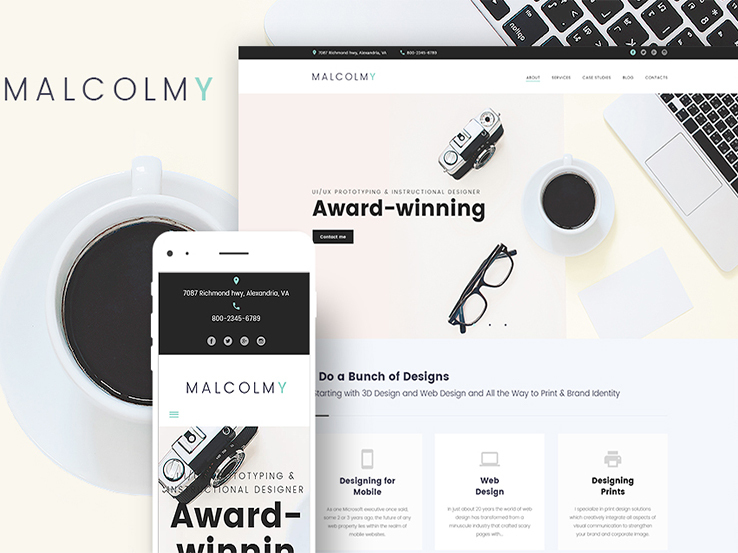 If you are searching for the way to showcase your portfolio in the most effective manner, consider this responsive personal blog WordPress theme powered by Cherry Framework. Video files and photo gallery are integrated into its layout. Thanks to that, the web page looks interactive and appealing. Bright visuals with hover zoom effect draw visitors’ attention. To some extent, the template resembles an infographic. Different types of content are separated from one another with the help of contrasting colors. The template features everything you need to build a fully-personalized website. This includes valid code, advanced theme options, portfolio, services and testimonials sections, and much more. P.S. You don’t need to worry about Google rankings. The theme is SEO ready to raise you to the first lines of search engine results. This is a kind of “wild” personal blog WordPress theme. It is best suited for a photographer portfolio presentation. You can place your most original works into the full-screen slider of the theme and explode the net with your creativity. The best thing is that your portfolio will look just as impressive either on mobile gadget screens or wide desktop computer monitors because the theme is responsive. Big sliders are not something completely new and innovative in the world of web design, however when it comes to dynamic presentation of your content and grabbing public attention, it is really difficult to find a good substitute for them. In general, the design of this theme is minimalist. The main menu is hidden. It slides out from the opposite side of the screen when you click on the hamburger icon. 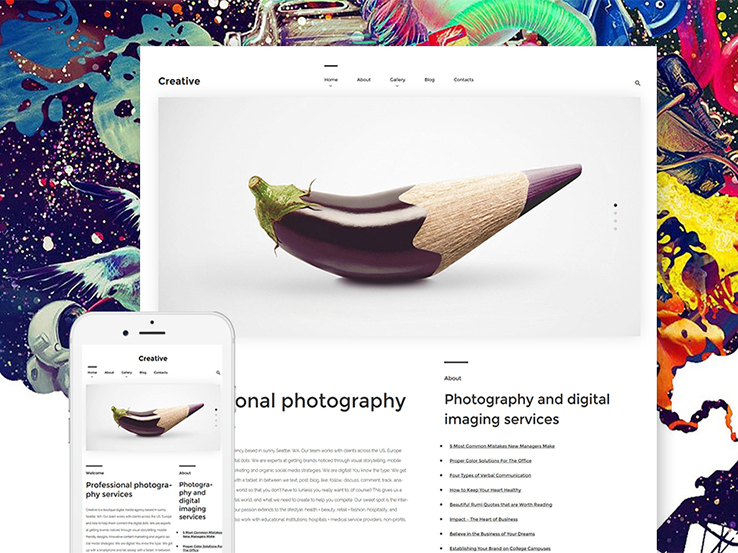 Creative is a personal blog WordPress theme for artists, photographers, and designers. The theme is built on Cherry Framework 4, which is a simple, accurately crafted framework that offers you easy installation, solid Bootstrap options, numerous shortcodes and widgets, and a simple way to update the current design with Parent/Child theme possibilities. The theme is shipped with MotoPress Editor plugin that can ease the process of editing your website. With its help you will have an opportunity to manage page elements in the visual drag and drop mode. MotoPress slider is also onboard. It lets you choose between multiple slider plugins when crafting your pages, including Cherry Simple Slider and Premium MotoPress Slider which comes with the template. They allow you to assemble professional-looking slides of text, images, and videos, spicing them up with various transition effects. This clean and clear personal blog WordPress theme can become a great website for a publishing company. Apart from its trustworthy appearance, it offers you so many features that will turn the building of your website into a child’s game. Are you interested in everything related to art? Can’t miss any exhibition? Well, this personal blog WordPress theme for an exposition room will help you spread the word about current and coming cultural events all over the Internet. The theme features a very simple and clean design, which is a great example of how to organize a lot of text and visual content in an easy to navigate web page format. Good Way welcomes the visitor with a large slider supplied with a nice hover effect, the list of staff (coming with people’s thumbnail photos) who will be happy to introduce art connoisseurs to the new artworks, detailed overview of the recent exhibitions, as well as an easy to access schedule of the upcoming events. Believe us, Good Way is a smart choice for highlighting your artistic works. If you are not afraid to be bright and differ from the flock, you’ll love this personal blog WordPress theme for photographers designed in neon colors. No doubt, it will draw users’ attention to your photos. Showcase your projects and create an unlimited number of image galleries on your site. Use tags and categories to divide your galleries into sections for easy navigation. Do you think you need sidebars on your site? 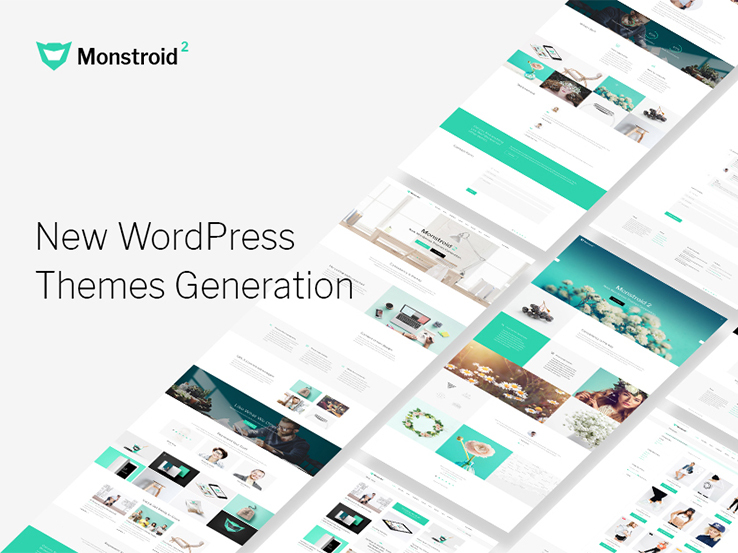 The theme is delivered with free user friendly and lightweight Cherry Sidebars plugin. It lets you create custom sidebars and add them to your page layout easily. We are sure you’ll be glad to know that the theme’s code and structure are additionally optimized to comply with the Google guidelines for websites, which will help your resource reach the top of search results. Here is a business-like personal blog WordPress theme for those who like books, reading, and are in the publishing business. 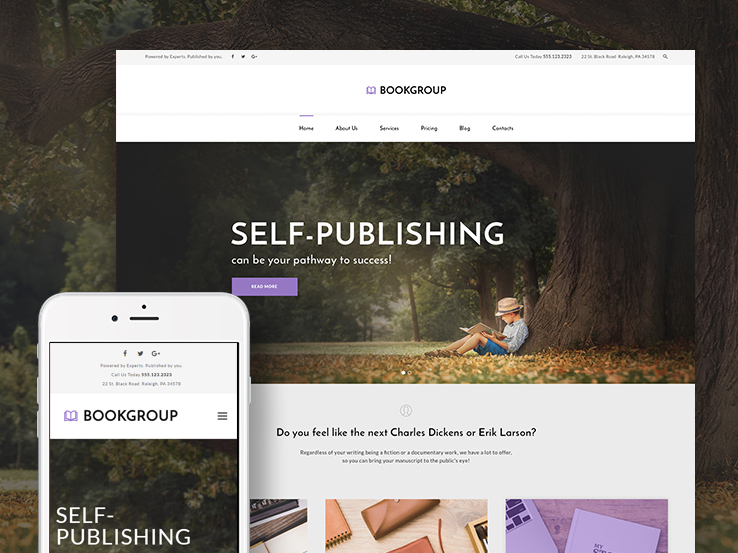 BookGroup is a fully responsive and fully editable theme created for book publishing websites. It will help you showcase all your services in a proper way. Cherry services will let you capture customers’ attention with full and detailed information about who you are and what you do. Show your clients that you are reliable through testimonials. Let them see people’s feedback about your services. Pleasant backgrounds and warm tones of this theme will look appealing for every person, while versatile header and footer styles and multiple blog layouts will show the uniqueness of your website. This Cherry Framework 5 based modern theme is equipped with WordPress Live Customizer and Power page builder to provide you with enjoyable customization and easy page creation. 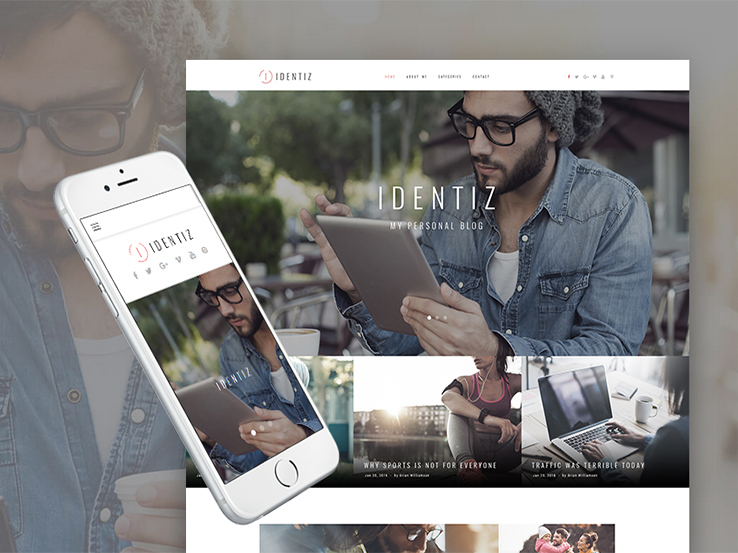 Activello is a clean, minimalist multipurpose personal blog WordPress theme developed using Bootstrap front end framework that makes it fully responsive and mobile friendly. The theme features pixel perfect graphics and design. Activello is shipped with several custom widgets and a full-screen slider to showcase your content with style. 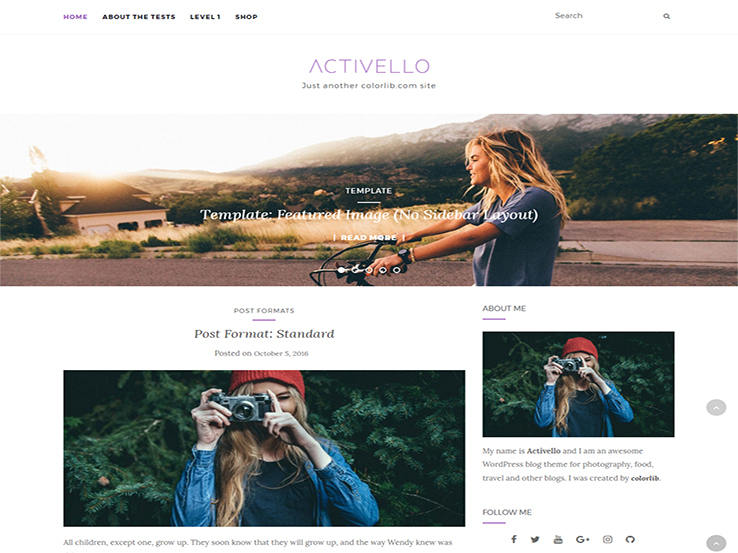 Activello theme is a very flexible free WordPress blog theme that is well suited for food, travel, adventures, photography, personal, fitness, corporate or any other kind of blog. The theme is optimized to work with WooCommerce, W3 Total Cache, Contact Form 7, Gravity Forms, Jetpack, Yoast SEO and many other free and premium WordPress plugins. The theme is SEO friendly, has Schema compatible structure that will make Google love your website. Activello theme loads fast providing additional SEO and usability boost for your resource. This personal blog WordPress theme is designed in a “loud” style and is ideal for any creative agency or individual who is looking for a “screaming” design. 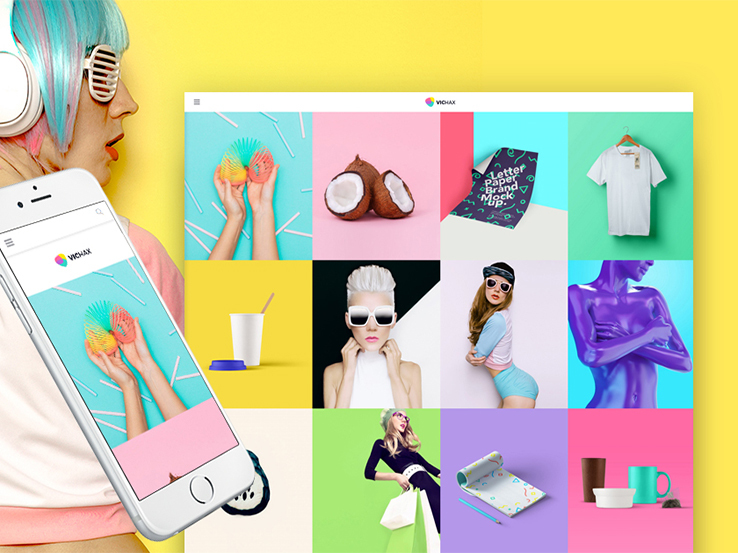 This responsive theme has a clean and minimalist layout enhanced by bright colors and uncommon images. Custom Google fonts intensify the impact of the theme on the viewer. The theme is coded with valid XHTML + CSS. It supports the current version of WordPress CMS. Digital Interstructure is search engine optimized, which will provide your website with high Google rankings. It is also compatible with Chrome, Safari, Firefox, and IE11+. The theme can be used on an unlimited number of domains. In addition, support and updates are included in its package. Theme video overview will tell you more about its functional features, so make sure to watch it. 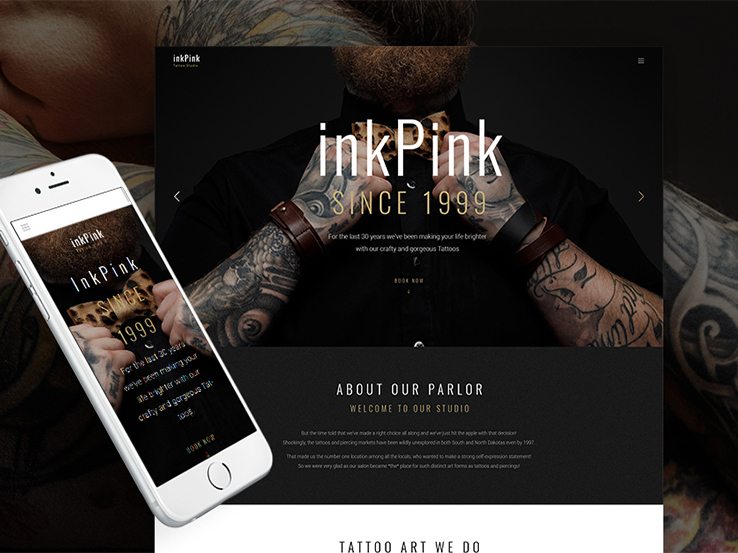 This dark personal blog WordPress theme is designed in the best traditions of tattoo salons and tattoo masters. The galleries of tattooed people make a deep impression on the viewer. All design elements of this theme correspond with the latest trends, which is essential as tattoos are at the peak of popularity nowadays. 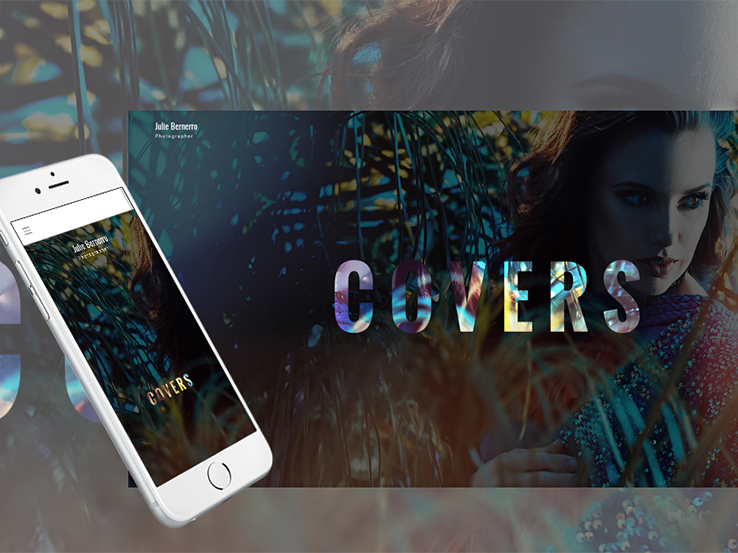 7 header layouts are included in the theme’s package so that you can choose between them. Please don’t worry about the theme’s customization. Customize your site with multiple theme options. View all the changes you make to your design immediately, without reloading your page. InkPink is equipped with Live Customizer, so adjusting the design of your theme is as simple as it gets. The theme has a clean, well-structured, and carefully commented code written in accordance with the top web standards. It lets you understand the purpose of any of its elements easily. If you know a lot about fashion and are ready to share your knowledge with people, use this personal blog WordPress theme to create a trendy website on its basis. Gisele is designed in black and white colors, which always differentiate the resource from other websites and adds a personal touch to each and every photo and article you publish. The theme is packed with a huge set of premium widgets allowing you to build feature-rich and versatile layouts. Posts carousel, simple slider, image grid, category tiles are included, just to name a few. Use the included widgets and WordPress live Customizer to build your website and see how changes take effect in WYSIWYG mode. The theme has valid and well-documented code, which is also a huge benefit. 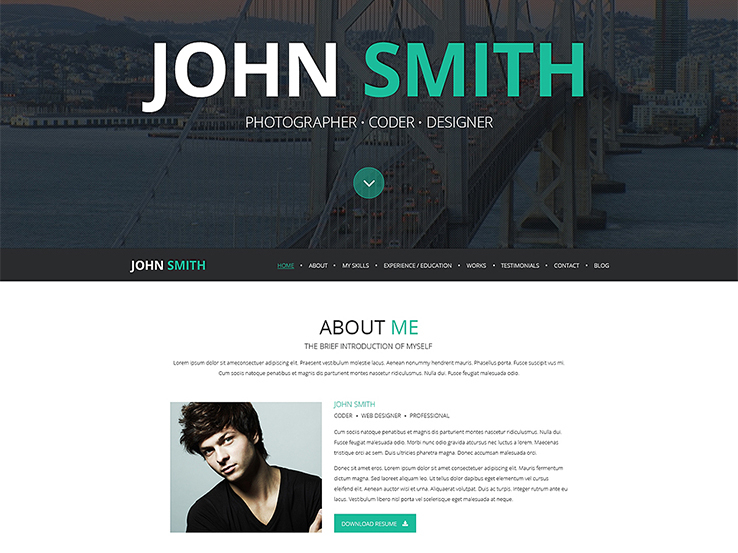 This is a neutral personal blog WordPress theme that will meet a web designer’s needs. It is responsive, so your website will quickly adapt to any gadget screen. Text and images are also flexible, which means that they will be rendered correctly. No limits in terms of location and device lead to conversion increase and this sounds really sweet. Box is retina ready and will perform and look gorgeous even on displays with high pixel density. You can give your visitors the feel of true immersion, an illusion of depth in the 2D environments of your site. Parallax always makes user experience onsite better and make the visitors come back to your website more frequently. Box is built on the powerful Cherry Framework that makes it an even more cost effective bargain. 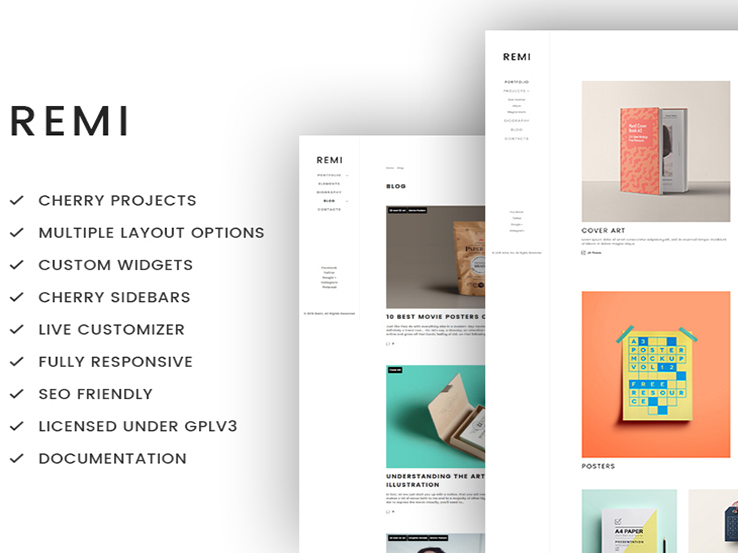 Remi is a super clean personal blog WordPress theme for a photographer’s portfolio. It allows you to create a gallery of your projects in a matter of minutes. You can choose from a large variety of animation and layout options, add custom meta data, and filter the output by tags and categories. All this is possible thanks to the Cherry Projects plugin, a combination of ease-of-use and advanced functionality. Remi also lets you choose from a large number of layout options and play with the structure of your pages. You can speed up your building process by saving your favorite layouts in a built-in library and use them whenever you need to create a new page. The theme allows you to choose from over 500+ Google web fonts to customize and adjust the design of your website according to your needs. Are you a freelance photographer? 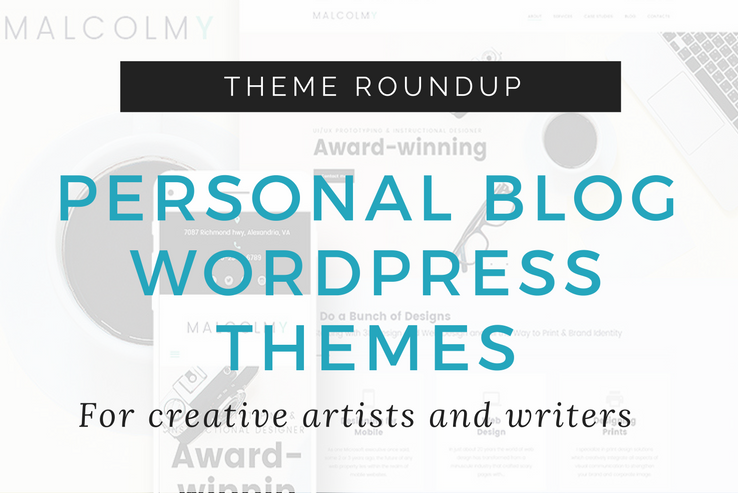 We know what you need to win more customers’ hearts, it’s a personal blog WordPress theme. By the way, Jon Bin is a good option to consider. It will promote your personality, your professionalism, and unique style in the best possible way. You can even sell your items on site. Just add an online store for free in 5 minutes. 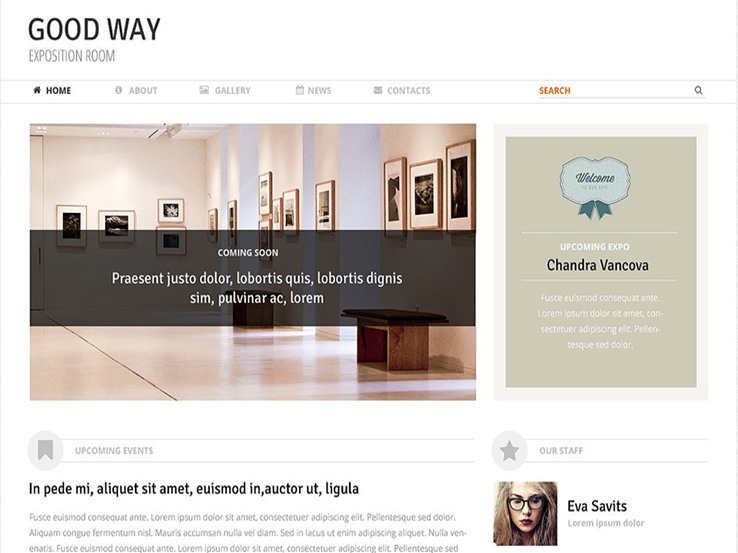 This Ecwid ready theme lets you do that. 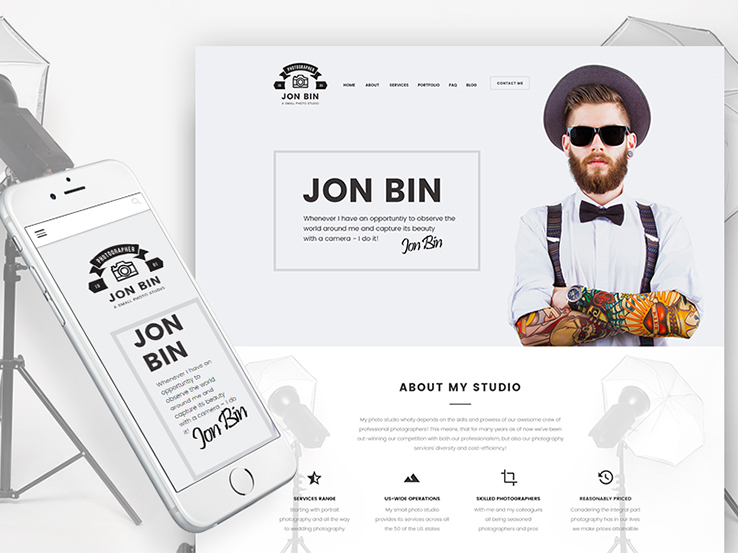 Jon Bin is delivered with 7 Header layouts. It is also equipped with a Booking Form. Let your visitors shop from you more easily with the help of an advanced Booking Form. Keep in touch with your clients and provide them with the best service ever. The theme is licensed under GPLv3, which also provides you with greater flexibility. Every writer needs a professional website to tell the readers about their new books, articles, etc. This personal blog WordPress theme is a possible choice for you. 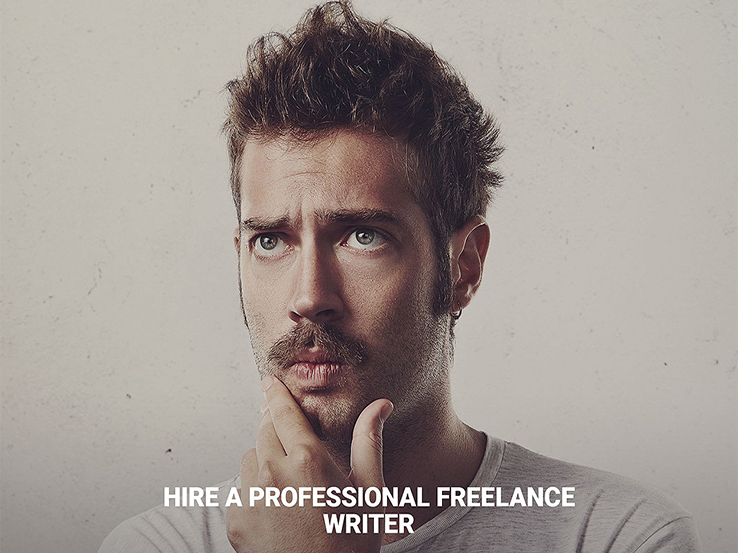 Jack Peralta WP theme was created to help you become recognized and hired. It features a screen-wide slider, round banners, neat social sharing icons, etc. Its uncluttered layout helps users find the desired information in a matter of seconds. The template was made 100% responsive, cross browser compatible and SEO-friendly. It offers the power of Bootstrap functionality and Cherry Framework, all meant for seamless installation and customization. The theme is also shipped with beautiful Parallax effect and usable Lazy Load effect. The former will immerse the users deeper into the website environments, the latter will take care of their comfort. Your visitors won’t wait in front of an empty screen while your content is being loaded. This minimalist personal blog WordPress theme was developed for UI/UX prototyping and instructional designer. Its professional look will become your business card in the world of industry experts and higher salaries. What could make your website look truly reliable and proficient? Design, navigation, and cool widgets matter a lot, but there is something special to showcase that you’re really worth working with. It’s all about Cherry Team Members plugin. Feel the importance of your team member’s presentation and share all the details about your team’s bio with your customers in the most in-style way. Improve the usability of your website dramatically with Cherry Search plugin for WordPress. The plugin is based on AJAX technology allowing your visitors to browse the quick search results without leaving the page. Are you a teacher of art? Would you like to have more students at your school? Grab this positive personal blog WordPress theme for an art school and start building your website. This is a tested way to get better promotion and earn more money as a result. In addition to Power drag-and-drop page builder, multiple layout options, and content modules, Leonardo comes with an Appointment Manager plugin. It is a real time-saver. The plugin will let your customers book an appointment directly on your site. This will help you organize your schedule easily and be more productive. Besides, the theme comes with a Timetable Plugin. Thanks to that you can create online schedules for a single or multiple events, customize the appearance of each event, and display all the needed items in a carefully-crafted timetable. 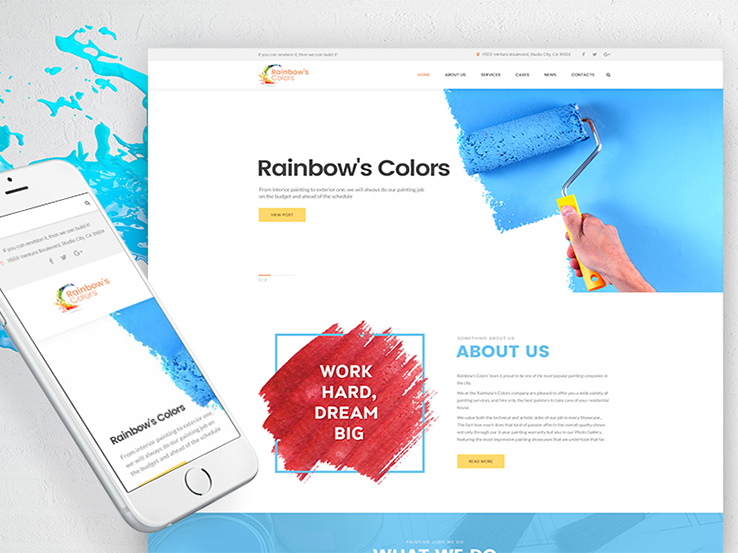 Rainbow’s Colors personal blog WordPress theme is a perfect solution for building an eye-candy painting company website. The theme’s design is clean and colorful at the same time, and includes multiple blog layouts and various header & footer styles. It is targeted at a wide ranging audience. A number of additional pages will help you present your painting company in detail, while a large number of content modules will help you to fill up your house painting website with multiple types of content. Cherry Projects plugin allows you to create a gorgeous showcase of your completed projects, while Cherry Services and Cherry Team Members plugins will help you present the whole range of your painting services and team. An advanced search will provide your visitors with immediate search results by means of keywords, while a newsletter subscription will help them stay informed of all painting services updates and hot painting deals. Pre-loaded Power Page builder will help you compose great layouts of any complexity without touching a single line of a code, while WordPress Live Customizer will help you enjoy the simple customization process. Enjoy seamless web development with Rainbow’s Colors theme! Start is a personal blog WordPress theme for any creative agency. It features clean design and minimalist layout. Start is a mobile friendly theme, so you can be sure that your website will look the same across the entire range of contemporary handheld gadgets. By the way, did you see the amazing theme’s slider? It is also responsive, and mobile device users will be able to enjoy it. Start comes with Custom Background Image, Custom Background Color, Theme Options, and Menus Capability. The theme is coded with valid XHTML + CSS. It supports the current version of WordPress. The theme is search engine optimized, so you don’t need to worry about your Google ranking. You can use the theme on an unlimited number of domains. Support and updates are included in the package. Are you a photographer obsessed with your passion? If you still don’t have a personal blog WordPress theme, you should get this one right now and launch a decent website as soon as possible. 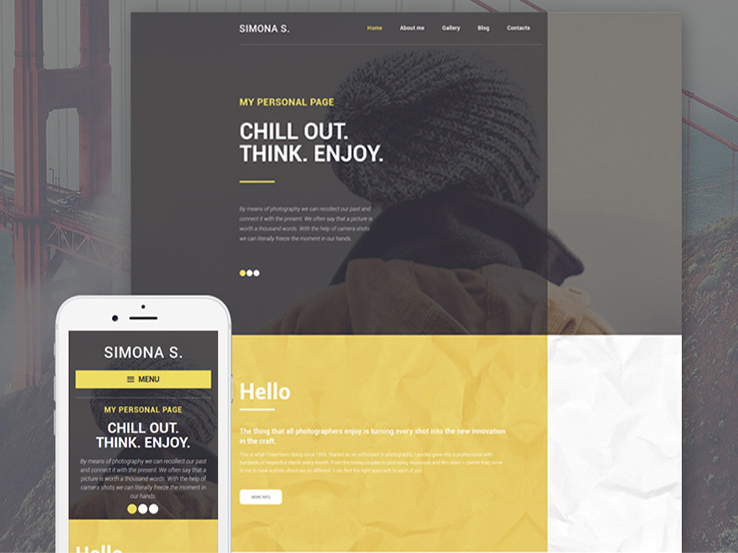 Simona S. combines a clean design and user-friendly interface and offers a great solution for showcasing your content. It is not overloaded with visual effects and ensures a fast loading speed. In addition to that, it is built in accordance with the latest web design trends and allows you to promote your works in an efficient way. PSD files are included with the template’s package. All of them are fully customizable and were optimized to be used equally well by experts and beginners. Detailed documentation is also here for you to make the most out of your website’s functionality. Running a beautifully designed presentation site, or, in other words, a personal blog, is a proven method to tell your story on the web in a memorable way. 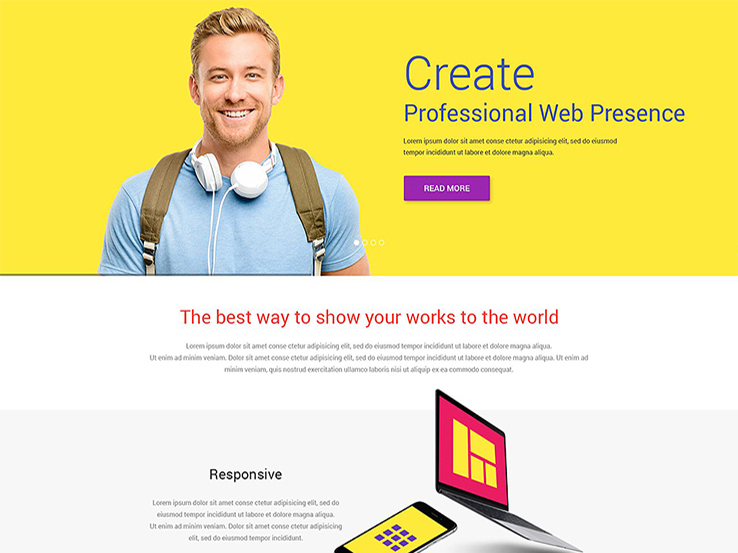 This Web Design WP Template could be a perfect fit for that purpose. Created in mega popular flat style, it looks super trendy. Big slider with bold visuals immediately grabs users’ attention. Grid-based galleries look spectacular over the snow-white background. The theme features a fully responsive layout and offers full power of Bootstrap and Cherry Framework functionality. Newsletter subscription, social sharing buttons, and contact form have been provided to make it easier for your visitors to get in touch with you and follow your updates. The theme is equipped with Parallax and Lazy Load effects, which makes it even more attractive.